The Euro US Dollar (EUR/USD) exchange rate has remained muted and the pairing is currently trading at an inter-bank rate of $1.1224. This afternoon, the US Chicago Purchasing Managers’ Index slipped to a worse-than-forecast 58.7, however this still signalled growth and this figure held above the low that was seen at the start of the year. Meanwhile, the Michigan Consumer Sentiment Index rose to a higher-than-anticipated 98.4 in March. Sales of new homes in the US also rose by 0.667 million, rebounding in February to the best pace in almost a year. This rise was led by the Midwest as lower mortgage costs helped buyers afford properties, and transactions in the South climbed to the highest level since 2007. Early this morning saw the release of better-than-forecast German retail sales figures. In a positive data release for the Eurozone’s largest economy, retail sales rose by 0.9% in February despite the forecast contraction. Further boosting the single currency, the German unemployment rate dipped from 5% to 4.9%, the lowest rate since the German reunification in 1990. 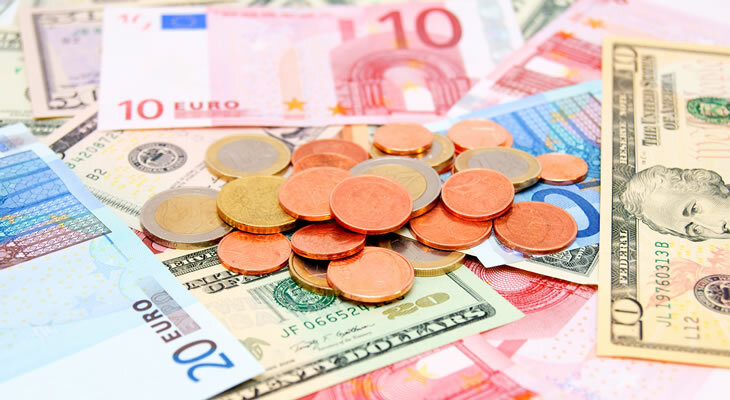 Despite this better-than-expected data, the Euro (EUR) slipped against the US Dollar (USD) earlier this morning with the exchange rate becoming flat this afternoon. Earlier today, US Treasury Secretary Steven Mnuchin said in a tweet that he and Trade Representative Robert Lighthizer had concluded ‘constructive’ trade talks in Beijing this week. These were the first face-to-face meetings between the US and China in weeks after falling short of the initial end-of-March deadline for a summit between US President Donald Trump and Chinese President Xi Jinping. Risk appetite likely increased on Thursday as US officials said China had made proposals during discussions on a range of issues, including forced technology transfer. Euro US Dollar Outlook: Will the EUR/USD Exchange Rate Slide on Rise in US Manufacturing? Looking ahead to the start of next week, the Euro (EUR) could rise against the US Dollar (USD) following the release of the Eurozone’s preliminary Consumer Price Index (CPI). If March’s CPI remains steady at 1.5% and core CPI holds steady at 1% or rises higher, sentiment in the Euro could rise. On Monday afternoon, the US Dollar could rise following the release of the US ISM Manufacturing PMI. If March’s PMI rises from 54.2 to 54.5 as forecast, the Euro US Dollar (EUR/USD) exchange rate could slide.